They didn’t share the wealth - Why should we share the pain? It's time to fight back, not cut back. 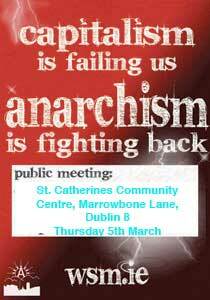 • Workers Issues on Indymedia.ie. Mick Burke and the Indymedia Collective are trying to set up a dedicated reporters group to report on the (potential) strike on March 30th. Read about it here. The Government has no problem finding money to bail out bankers and speculators, it’s only when cash is needed for special-needs teachers, the sick, or to improve run-down schools and hospitals that nothing can be found. The attack on pay and pensions is a class struggle by employers and the government against working people. IBEC’s aim is to reduce Irish wage rates and to make us think that a reasonable pension in old age is a privilege rather than a right. The attack on the public sector is just the start. Private sector wages are being driven down too. Even the Minimum Wage of €8.65 an hour is criticised as too high by Fianna Fáil ministers like Billy Kelleher, who ‘earns’ a cool €139,266 before expenses (and that’s after his 10% cut - and after the 65% pay rise TDs have received in the last four years). why don't we start doing it from the mayday? Noel Dempsey should not blame the global recession for all our problems.YOUR party gave away our biggest asset,our national natural resources,our gas and oil.Have the courage minister to undo that deal,put our country first,then and only then will you begin to crawl out of this mess with some dignity.The citizens of this country deserve better. Absolutely right about the rotten Corrib Gas deal, Margaret; they were not only corrupt, but clueless, & treacherous to 'their own' people. Nationalism or patriotism mean nothing to people who have sold out to international capitalism, greed, & power. Spot on about the Corrib Gas field. If the government can nationalise the bank(s), why can't the same be done for the gas? I can't imagine there's much time left for Fianna Fáil. It's quite a Freudian slip, that when you want to go to Fianna Fáil's website, you have to type in FiannaFail.ie - fail indeed. Goodbye, Fianna Fail. Where have all the credits gone, from the growth years Mr Cowen? Enjoy the trip this one last time for your surely for the sack!.. It's good to see that the WSM has been postering around town (Dublin) for the March 30 strike. A very good poster at that, but where are all the other left groups' posters? The employers and the state do indeed intend to impose a defeat ,but the depth of the current financial crisis means that it will have to be a much worse defeat than anything that Thatcher imposed on Britain in the eighties . The idea of class struggle will sound less and less old-fashioned as this year goes on - whether people like it or not . Worthless nasty little goatee bearded little excuse for a human being ,is Finnegan .